And that keeps you watching through the drug, drug lawsuit, insurance, and catheter commercials. These shows are are paid to make sure you watch commercials. Every transition has to keep you watching, and it’s easier than ever when the topic is terrorism. 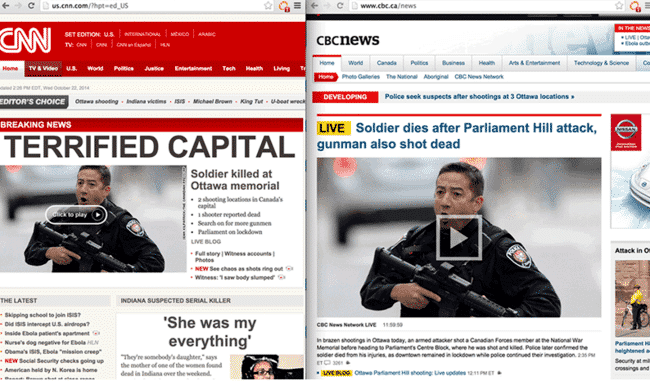 But here’s the problem: Coverage of terrorism causes terrorism. Not association. Not correlation. Causation. It makes terrorists feel vindicated. It makes them feel powerful. It inspires successful attackers to attack again. And it inspires copycats to emulate. Media coverage is the Viagra of terrorism, and instead of denying them what they seek and feed off of, 24/7 media has basically replaced their propaganda departments. We air their marketing videos. We show the faces of the attackers. We are selling them to the world as rock and movie stars that everyone loves to hate. And by doing so we guarantee a constant flow of new attacks. Why? Why would we do the exact thing that guarantees we’ll be attacked again? If CNN turns the attackers into terrorist superheroes through constant coverage, more people will buy things and executives will make bigger bonuses. This is a direct exchange. Ad dollars for lives. There isn’t one. Not yet. We don’t learn lessons from reading things. We need people to die. Lots of people. Maybe after a few more attacks the anchors and cameramen will realize their fear-monger is literally killing people, and they will refuse to do this type of coverage. Until then, stay tuned. Another attack is about to happen. The media has seen to it, and they’ll be there, distraught in the carnage, waiting to sell you something.